Sadhu Arunachala (Major A.W. Chadwick) of Sri Ramanasramam, Tiruvannamalai, is a good example of perfect devotion to our Guru, Bhagavan Sri Ramana Maharshi. The name and fame of Bhagavan Sri Ramana dragged him from England to India on 1st November 1935, and having come to Bhagavan’s Supreme Abode he never returned. 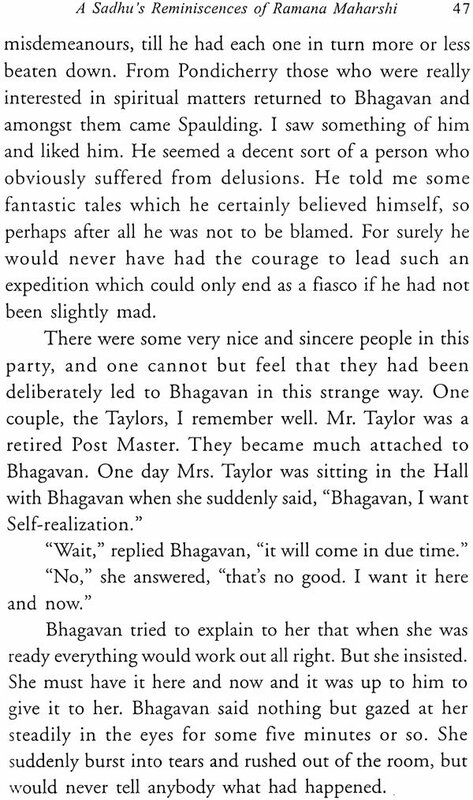 So naturally he has much to tell us not only of Bhagavan and his teachings, but also of many things that happened in Bhagavan’s presence. Sadhu Arunachala gives us in this book what he saw happening in Bhagavan’s presence but only such as have for the most part been unrecorded in the books of others. It is needless to say that the Sadhu records his facts with great accuracy and respect for truth and hence this book will be welcomed by the devotees of Bhagavan and others. Sadhu Arunachala of Sri Ramanasramam, Tiruvannamalai, is a good example of perfect devotion to our Guru, Bhagavan Sri Ramana Maharshi. Some twenty- five years ago the name and fame of Bhagavan Sri Ramana dragged him from England to India, and having come to Bhagavan’s Supreme Abode he never returned. (Yath Gathva Na Nivartanthe tath Dhama Paramam Mama. That is My Supreme Abode whence none returns. Bhagavad Gita XV-6). 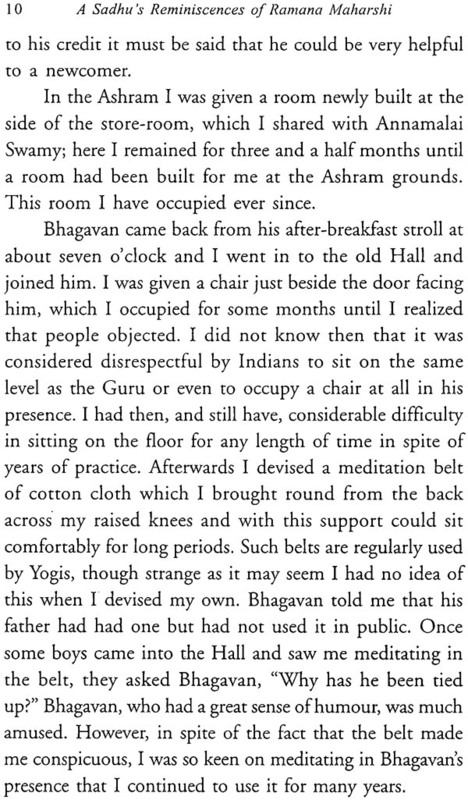 Visitors to the Ashram now see him sitting at the Shrine of Bhagavan every day punctually between 8 to 10 a.m. and 5 to 7 p.m. as formerly they saw him sitting in the old Hall in Bhagavan’s physical presence. So naturally he has much to tell us not only of Bhagavan and his teachings, but also of many things that happened in Bhagavan’s presence. The Ashram has given the English- knowing world the diaries of Swami Ramanananda Saraswathi, Sri Devaraja Mudaliar and Mr. S.S. Cohen. While the diary of Sri Ramanananda Saraswathi is a record of talks with Bhagavan through several years, the latter two chronicle day to day incidents. 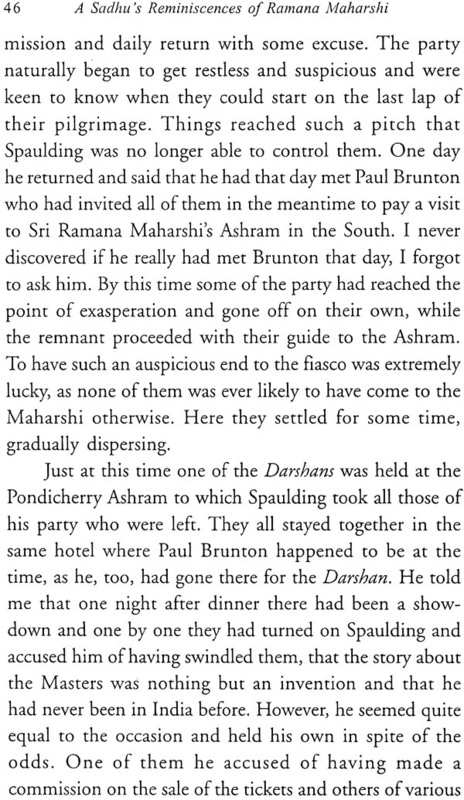 In the same vein Sadhu Arunachala gives us in this book what he saw happening in Bhagavan’s presence but only such as have for the most part been unrecorded in the books of others. 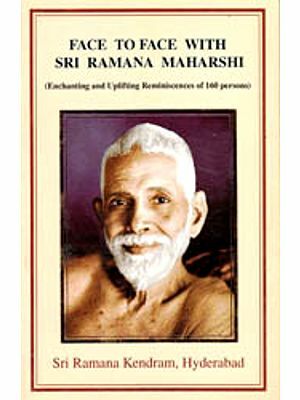 Thus A Sadhu’s Reminiscences of Ramana Maharshi seeks to supplement the previous publications. It is needless to say that the Sadhu records his facts with great accuracy and respect for truth and hence this book will be welcomed by the devotees of Bhagavan and others. 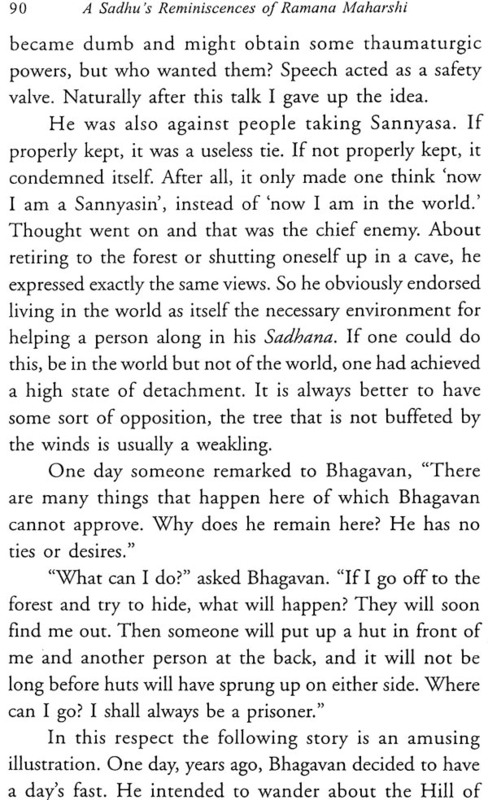 The writer of this introduction has a very great regard for the Sadhu as a writer, as he knows that the Sadhu has rendered into English all the original works of Bhagavan and had them perused by Bhagavan himself but has chosen not to publish them out of modesty as he feels there is no need to do so in the face of the Collected Works of Bhagavan given to the public by the Ashram as its own authentic publication. The Sadhu’s “Poems of Ramana Maharshi” published last year has placed us all in a debt of gratitude to him and the present Reminiscences increase this debt. There is no need to comment on the contents of this volume, which when once begun will carry the reader right through. 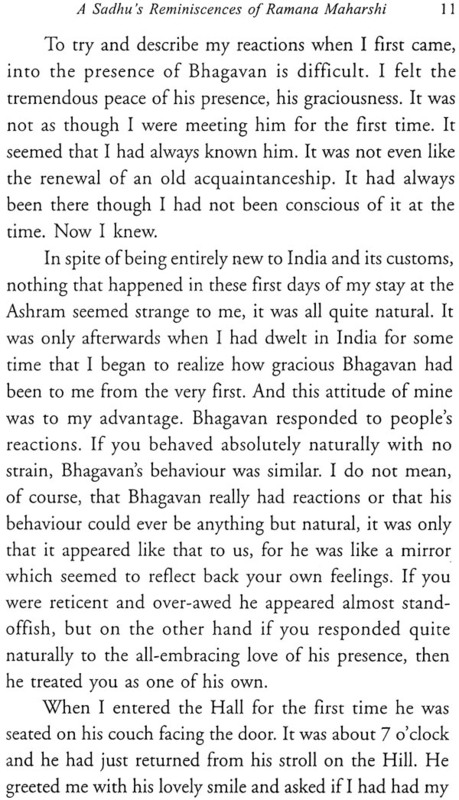 This gives the clue to the Sadhu’s inherence in Bhagavan’s Home. May Bhagavan bless him! This prefatory note ought to come from some worthier soul, but the Sadhu’s request to me could not be refused and that is my only apology for writing this. An ordinary reader will find this small book very interesting reading and useful too; a discriminating one will appreciate how the teachings have been brought in unobtrusively and, as it were, unconsciously; a good sadhak will delight to note how the meanings of maya, of “original sin”, of dhyana, savikalpa Samadhi, nirvikalpa Samadhi and sabaja Samadhi have been simplified. Without polemics the highest truths of the Upanishads have been lucidly stated and many a seeker will be thrown back into the bosom of Reality while reading it. Bhagavan Ramana was the greatest miracle in our living memory not only because He was the living Reality but also he made the same so easily accessible to his votaries among whom Mr. Chadwick – or Sadhu Arunachala – stands one of the foremost. I say foremost deliberately because he has made the same truths so clear in his inimitably simple way. 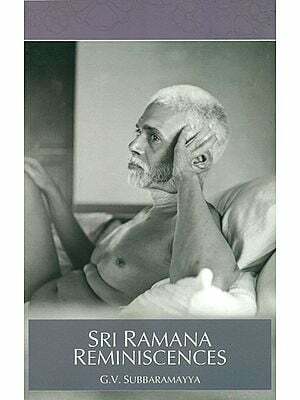 The pen picture of Sri Ramana is so vivid and complete that any worthy disciple cannot fail to testify to its being faithful in spirit and accurate in detail. 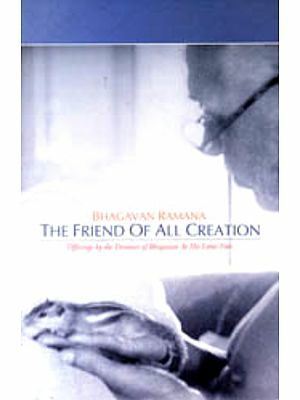 Of course there are some elaborate books on Sri Ramana which present the different facets of the Gem but this book presents the Gem itself to the readers! God bless the unostentatious writer of this small and invaluable book !